Pop. 2,499. In Yarmouth T., Elgin C., on L. Erie at the mouth of Kettle Cr. and C. Rds. 4, 20 & 24, 14 km. S of St. Thomas. Pop. 358. In Southwold T., Elgin C., on C. Rds. 16 & 20, 14 km SW of St. Thomas. Pop. 345. In Elgin C. on Hwy 4 and C. Rds. 4, 16 & 25, 1 km. W of St. Thomas. The history and origin of the place name have not been recorded. Pop. 139. In Dunwich and Southwold Ts., Elgin C. on C. Rds. 3 & 14, 23 km. SW of St. Thomas. Ontario's Rhubarb Capital-Home of the Rosy Rhubarb Festival! Pop. 76. In Southwold T., Elgin C., on C. Rd. 14 and the NYC Railroad. Pop. 50. In Southwold T., Elgin C. on C. Rd. 119,22 km W of St. Thomas. 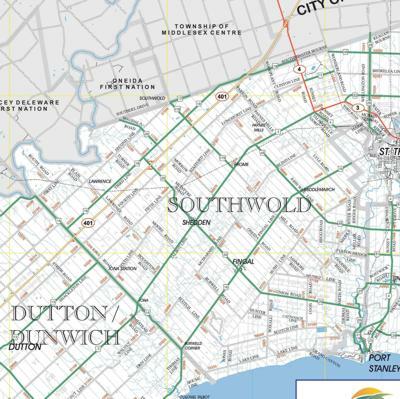 The community took its name from the T. which in turn had been named in 1792 after the village of Southwold in Suffolk, England.